This film was originally written for a male lead. However, Salt gained some early publicity when Jolie “replaced” Tom Cruise in the starring role, which I think was an excellent move. Jolie has been building up a solid action track record with Mr. and Mrs. Smith and Wanted, but this is her first real solo action flick since the Tomb Raider days. Roles such as these suit her perfectly. So who is Salt? After 100 minutes, the answer may still be a little fuzzy. 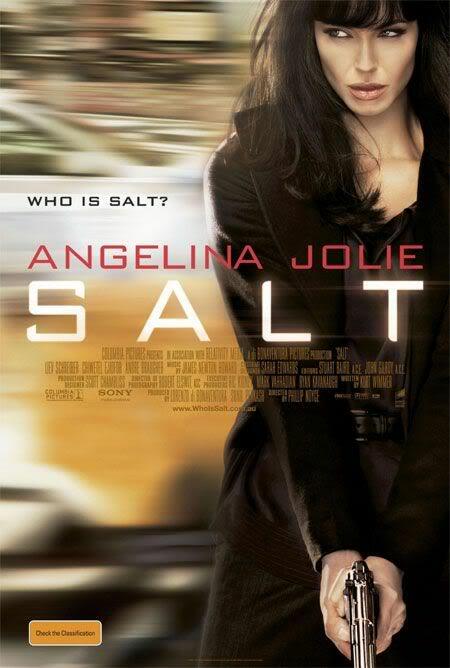 From her introduction, being tortured by North Korean captors, but never breaking her CIA cover, we know Salt won't give up the truth so easily. So right off the bat we know she's hard-core. As Evelyn Salt (Angelina Jolie) is about to leave the office for the day to enjoy a romantic anniversary evening with her husband (August Diehl), she quickly gets called back in to interrogate a mysterious Russian defector (Daniel Olbrychski) who reveals that a Cold War-era “sleeper agent” is about to reawaken and carry out a diabolical mission. The name of this ”sleeper agent” just so happens to be hers - Evelyn Salt. Evelyn’s colleague Ted Winter (Liev Schreiber) – who I just love btw - is stunned by the accusation, but fellow agent William Peabody (Chiwetel Ejiofor) wants to keep Evelyn in custody to question this matter further. However, eager to clear her name and ensure her husband’s safety, Salt breaks out of her own office building and goes on the run. The twists and turns that follow lead the audience to question whether Salt really is the mole Orlov claims her to be, or if she really is indeed bei ng set up. Ultimately, the deceptions go deeper and the stakes go higher than you would think possible. It’s “The Fugitive” meets “Mission: Impossible” in a post-“Bourne” era - loads of smart action, twists and turns. It definitely had me guessing throughout the film. It's a fun and entertaining summer movie to say the least and if you’re a fan of Jolie or Schreiber I’d definitely recommend seeing it.